Revenge is... is a company that focuses on doing good. Here is some information about them: "Our products deal with important social issues of today while displaying simple yet meaningful ways to enact change from the landfill up. To start, our T-shirts are made from a blend of recycled plastic bottles and/or organic cotton. Our reusable hybrid coffee/tea mug, eco-spout and tuck away bag enable each of us to significantly reduce our use of the plastic water bottles, Styrofoam cups, and plastic grocery bags that clog our landfills. They also reduce our need for paper cups and hot sleeves and paper grocery bags. By wearing our products, you will be a billboard for change and inspire others to participate in helping to make our world better." Also, 5% of their net sales are donated to charity. For my review, I was sent these two cute t-shirts (sorry you can't really see the black one in the first picture very well). One has bell peppers on it and the other has a green elephant. 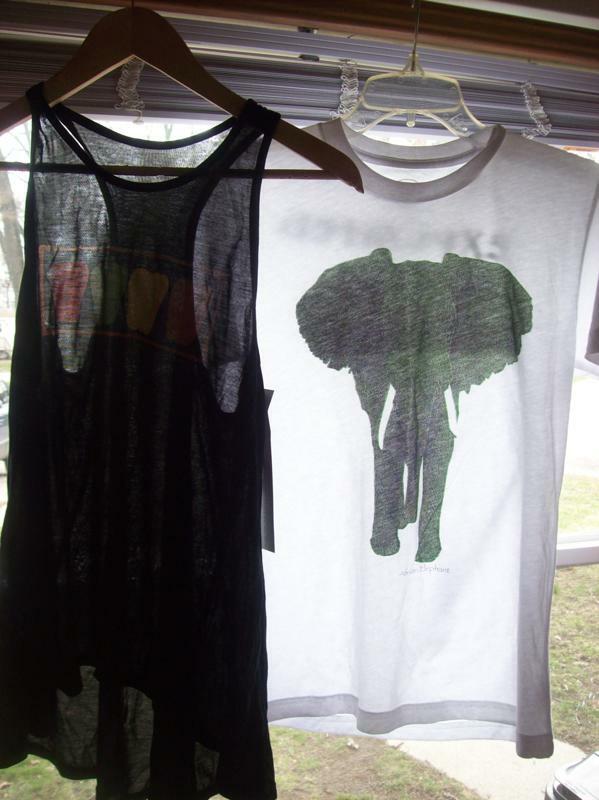 I chose the one with the elephant because that is my brother's favorite animal and his favorite color is green. I am going to give it to him this weekend. 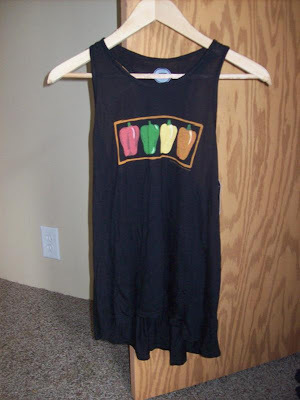 The other shirt I thought was cute and perfect for a nutritionist to wear. Both shirts are super soft which is awesome. One thing that I really liked is on the label of the bell pepper shirt, it says some nutritional info about peppers! That's great! The cut of the shirt is trendy and will be perfect to wear in the summer. The shirt retails for $49. I really like what this company stands for and think that their clothing is super cute. Thanks Revenge is. I also like what this company stands for. Have made a notation for later, before we go on holiday. Wow, very cool and very cute!